Born Gaynor Hopkins in a small Welsh town near Swansea, music was always a centrepiece of the Hopkins’ household. Bonnie recalls how the neighbours would gather to hear her mother, a lover of opera, singing inside the house. As a teen Gaynor would jot down lyrics to songs her father had taped on his reel-to-reel recorder so she could stand before the mirror to perform her favourites. Gaynor was especially impressed by the soul of Motown and the passion of Janis Joplin, and harboured her own dreams of a singing career. It took some persuasion by her family, but Gaynor agreed to enter a local talent contest. She finished a respectable second, but the stage debut gave her confidence and sparked the dream. Soon after Gaynor became one of the Dixies, the backing singers in Bobby Wayne’s band. Under the stage name Sherene Davis, the 17-year-old gained professional experience in a broad range of musical styles. Before too long she was fronting her own band, Sherene and Imagination, doing regular gigs at The Townsman Club in Swansea. Here she fell in love with Robert Sullivan, the man she would marry in 1973. The marriage proved to be the ballast in the long successful career that lay ahead. One night Chappell Music talent scout Roger Bell caught Sherene’s act and went straight to London to tell songwriters-producers Ronnie Scott and Steve Wolve about the fantastic voice he’d discovered in Swansea. 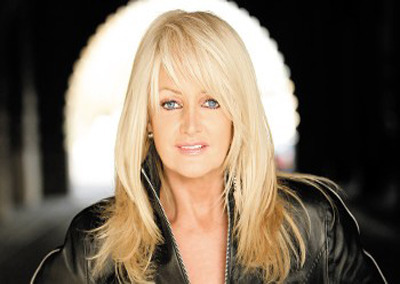 A demo was made, contracts signed, and they conjured up a new name – Bonnie Tyler was born! Bonnie’s first single, My, My Honeycomb got little more than local airplay. A second release flirted with hit lists for months until on 30 October 1976 Lost In France jumped into the U.K. charts and didn’t budge for ten weeks. The song became a European hit and made one of Bonnie’s dreams come true when she appeared on Top of the Pops. Bonnie’s 1976 debut album The World Starts Tonight earned her critical acclaim, a solid reputation as a promising new artist and charted across Europe. But a single, It’s a Heartache , for an upcoming album really broke the sound barrier. The track took the pole position in a lot of European countries, and most importantly, landed at No. 3 on the benchmark Billboard Hot 100. The song, one of the biggest hits of 1978 even won gold on the American Country Music chart. 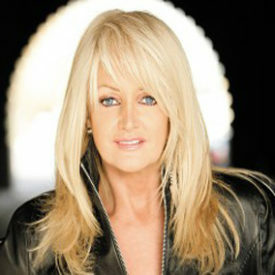 A couple of years later Bonnie’s career reached new heights with the release of Total Eclipse Of The Heart , and put her in the history books as the only Welsh artist to hit the number one slot in the U.K. and the U.S. The album Faster Than The Speed Of Night – containing Total Eclipse Of The Heart , the title track and Have You Ever Seen The Rain became the first album by a female artist to enter the U.K. charts at number one and it won two Grammy nominations in America. All the while, Bonnie continued to do what she still loves best performing on stage at hundreds of sold-out venues around the world. The records kept on coming through the years, her studio albums, compilations, and in collaborations with other artists such as Mike Oldfield, Todd Rundgren and Rick Wakeman. In the course of her phenomenal career, Bonnie has won numerous awards and added to her immense fan base through her unfailing ability to churn out hits. Now Bonnie’s back with Heart Strings a collection of songs balancing the hard edge of rock with a symphony orchestra. These are the songs of others, but unmistakably interpreted by the voice of Bonnie Tyler.